I bet I am one of the rare Korean who sucked on “Math” at school. I don’t do well with numbers. Seeing unorganized numbers used to give me headaches and I am still mad at why cell phone numbers has to be 10 digits. However, when my 7th grade daughter asked a math homework question (the algebra!) I was sure I wasn’t that dumb. ‘I am smarter than 7th graders for sure’. The beauty of arrays of numbers getting simplified and reaching to the correct answer on a white piece of paper! — It is the black and white beauty of Algebra. The moment of triumph and celebration of human intelligence! But then, the triumphant joy ended soon when she demanded to explain ‘why?’. That makes a different story. There is no why. More precisely, I couldn’t explain the ‘why?’. Sometimes you just get the answers in life without knowing why. I wish I can give all the answers of ‘why?’. One of the fearful moment as a parent is that you have explained things in the simplest possible way to your children but still couldn’t get them to understand. So when life throws you with complicated ‘why?’s, treat yourself with uncomplicated food. Here is a simple pork dish everyone can make that does not require any brain work. I will call it easy Korean pork for dummies. To clarify, I am NOT saying you are dummies. I am just saying, because it is super easy, that even dummies to any cooking can make this. 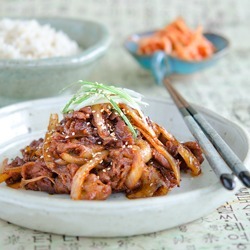 The glorious Korean name for this dish is “Jeyook Bokkeum (제육볶음)”. This pork does not ask you why and it is, Oh!, so delicious! 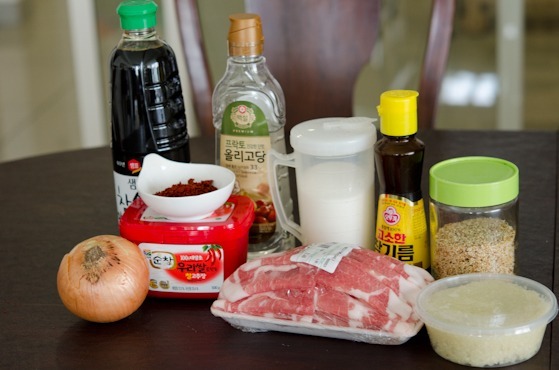 Basic Korean ingredients; soy sauce, corn syrup, sugar, sesame oil, sesame seeds, onion, Korean chili flakes and chili paste, pork, minced garlic. 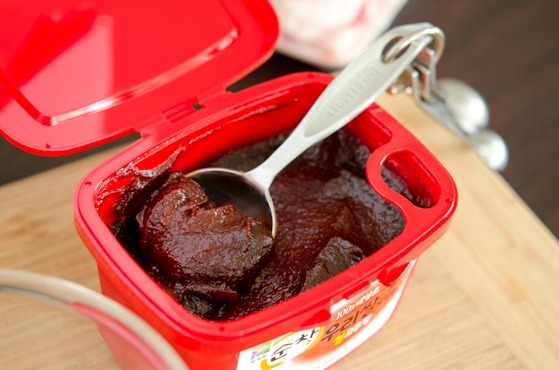 Here is the Korean chili paste in case you are wondering. 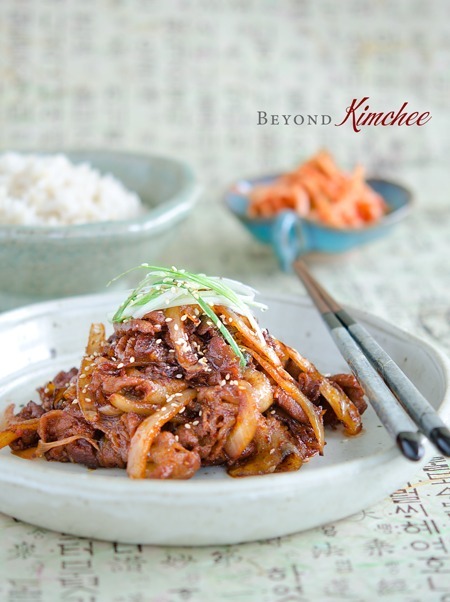 The mother of all Korean goodness, and a must have for Korean cuisine. Combine all the sauce ingredients. Corn syrup is an optional. It gives the “Bling-Bling” look to the dish but won’t change the flavor much. “Ginger!” Please, add my friend, Ginger, to the list. Mix the sauce! That’s it! You can use any cut but in paper thin slice form. I used pork neck meat which is the only cut that has marbling in the meat. You can get this paper thin cut in Korean grocery stores. Dump the sauce over the meat. 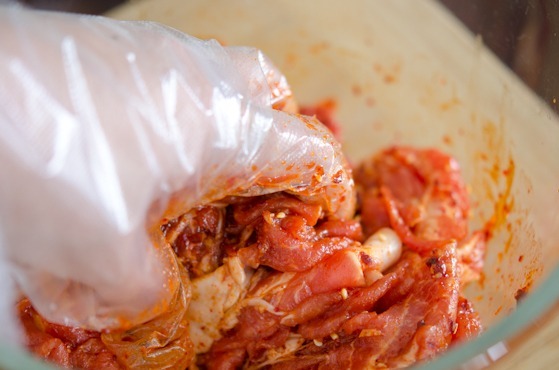 Mix, rub, knead, massage, squeeze, or use whatever tricks to mingle your pork with the sauce. Drizzle a little oil in a skillet over medium-high heat. Add the pork and throw some sliced onion. When you hear the loud sizzling sound, start tossing to cook everything evenly, about 3-5 minutes. “Something smells really good in here!”. My little boy came into the kitchen to investigate what his mother is cooking. “A pork dish for dummies, my dear!”. I responded with a *questioning* smile on my face. 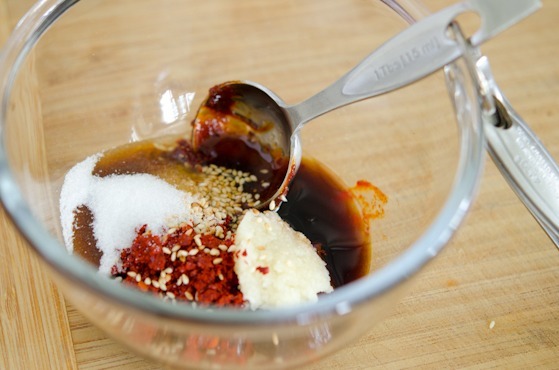 In a small mixing bowl combine chili paste, chili flakes, soy sauce, sugar, garlic, ginger, sesame oil, sesame seeds, and corn syrup, mix well. 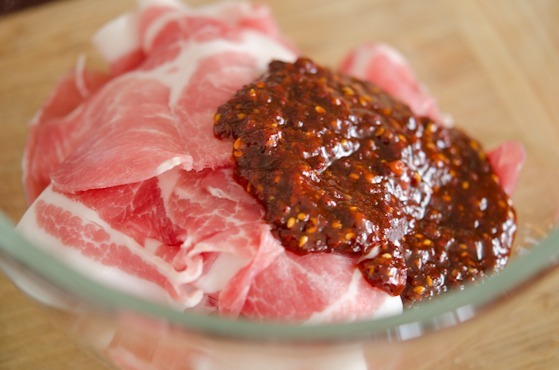 In a large mixing bowl combine pork with the sauce, and mix well to coat all the pork slices with the sauce evenly. Drizzle 1 Tbsp oil to the skillet and bring it over medium-high heat. 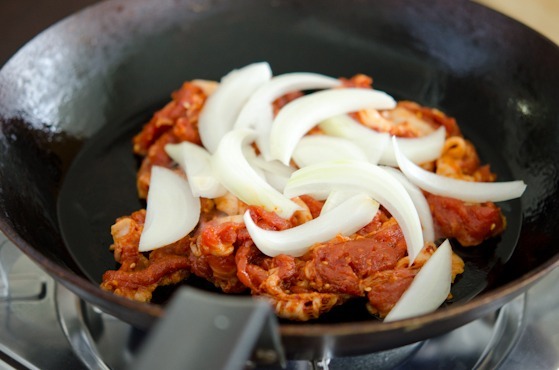 Place pork over the skillet and add the sliced onion on top. 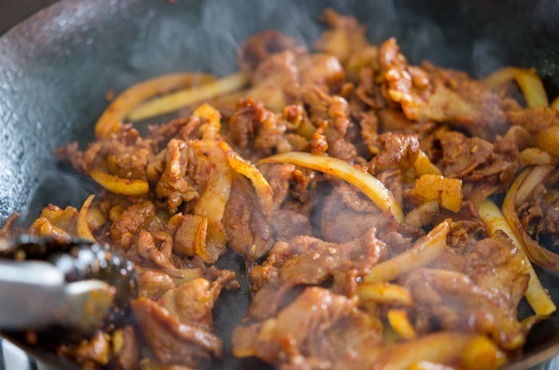 When they sizzle, start tossing everything to cook evenly all the way or until the pork is fully cooked and onions are soft, about 3-5 minutes. Easy-peasy indeed! And looks darn tasty. I actually enjoyed 7th grade algebra. But the more advanced math? Let's not talk about that. ;-) Very nice recipe - thank you. Yup, I know what you mean. I am drooling just over your photos -- I can practically smell this in the pan and feel the scent clinging to my hair. Thanks for a gorgeous recipe! Mmmm... Jeyuk bokkum is one my favorites! I sucked at math too! Or so I thought... until I came to America and took stats in college and absolutely loved it and got my first A in MATH!! Anyway... I am now craving some of this... Yum!! Oooooooh wow wow wow! This looks beautiful, and I will definitely be making this. How lovely. We don't have an Asian market in our town, and I don't want to wait until my next trip (our nearest Asian supermarket is approx 25 miles away) so I will be attempting to thinly slice the meat myself. I'll semi-freeze it first so I can get it lovely and thin like that. Delicious, Holly, as always - thank you for posting. Semi freezing is great way to cut meat thinly. Let me know how you like the dish, Vicky. Thanks! 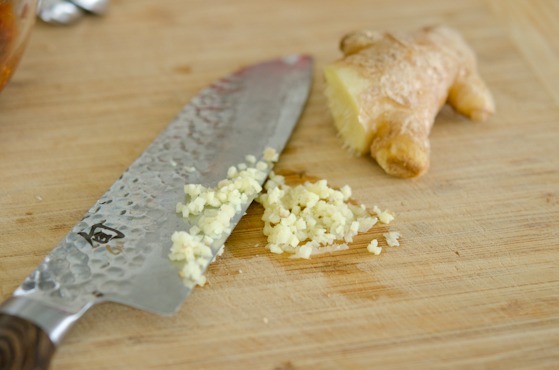 Some of my favorite ingredients are listed here! I love how easy and flavorful this is. I also feel like I'm the only Korean/Asian who does not do well with Math. All through school and even college, I received A's in every subject except Math and Science! :-(. Food looks delicious! I will have to try the recipe. Big bowl of rice please! This is wonderful... I love pork dish and although I cannot eat very spicy food, I will control the level of spiciness. My mouth water by looking at your beautiful pictures. Whenever I come to your site, it makes me think I need to have good light and good photography skills to convince everyone it's good food. You're always doing amazing job! You are so sweet Nami. Thanks for the compliment. I think having the natural light is the best tool for good photography and I still need to understand how to use light more properly. What type of lighting do you use in your pictures? 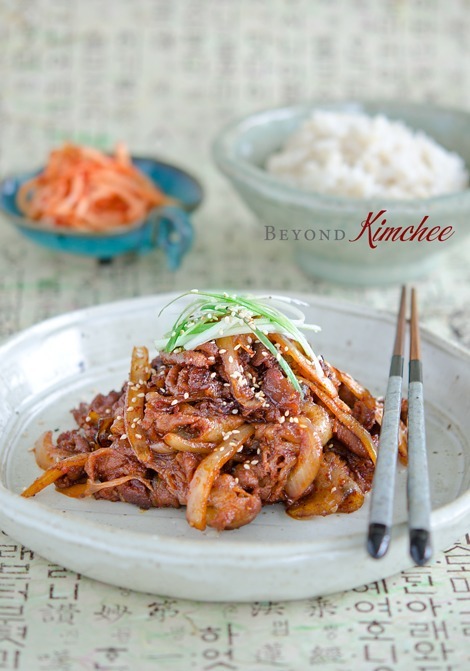 Korean Pork is a great dish and easy to make. One of my favorites!!! I finally cooked this last week and it was so so good! So much so that hubby was raving about it for days afterwards. So, I'm giving you love back for this. And the pork neck meat is the right cut for this, just the right amount of fat. I couldn't find the thinly sliced pork in my local butcher, instead I got a slab of pork neck meat and sliced them myself, I might have to do a post about this, hopefully sooner than later. That is great to hear. Would love to see the post how you make the dish. I just made this again today with a small handful of oyster mushrooms. And it's as tasty and addictive as I remember it!! Awesome! Mshrooms are great addition to this dish. Yeah, this spicy pork is quite addictive once you try it. Thanks! I'm determined to make my spicy pork better. I've tried three different recipes, and your proportions seem best to me. I might omit the red pepper flakes as I find the gochujang quite spicy as is. I haven't come across a recipe with corn syrup. I see it's optional, but what exactly does it add to the dish that the regular sugar doesn't? I'm curious. Thank you for a great site! Hi Jerry, you can omit the corn syrup. Corn syrup gives a nice sheen to the dish. I highly suggest to add Korean chili flakes, though. 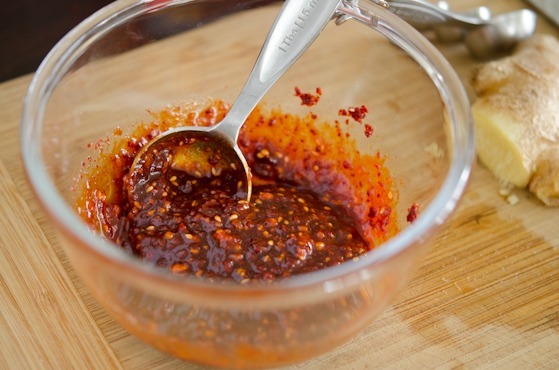 It adds a nice spicy chili kick that gochujang alone doesn't give. You can use only half the amount if the spiciness is a concern. Let me know if you need further assistance. Hi Holly, just wanted to let you know, that I'm a new, but avid reader of your entertaining blog. After some difficulties obtaining the ingredients (I hail from Germany) I cooked your Spicy Pork today. It was just wonderful! My son (13 yrs. and extremely choosey) loved it too! There are no left-overs, so the rest of the family will have to wait to taste it. :D Thank you! I made this and it was amazing. Thank you for the recipe Holly. We go to a predominantly Korean church here in Arkansas and we cook every Sunday. As much as I love my Eldresses I know some of them don't give the "secrets" to their dishes lol I have down the bulgogi and cucumber kimchi but until now couldn't get a good flavor on my pork! Oh my this was perfect. I love this website! Will it change the taste/texture to let it marinate overnight before cooking? Or do you recommend adding the sauce right before cooking? Of course you can marinate overnight. It will intensify the flavor. Let it stand at least 15 minutes before you cook. I followed your recipe this Sunday and served this to my friends at church. It was a big hit! Though, I had to substitute corn syrup with honey so it could have been sweeter than yours. 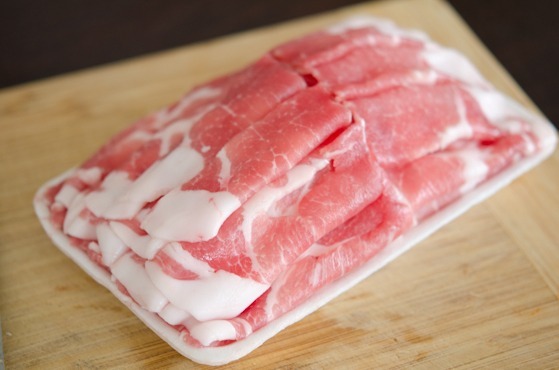 One thing I would like to mention is that H-Mart actually carries paper-thin cut pork for shabu shabu, but I don't think that's ideal for this dish. I found slightly thicker cuts of pork shoulder next to it, so luckily it turned out perfect! Thanks for sharing these awesome authentic recipes! Hi there! I just discovered this recipe through pinterest last week and I've already made it twice! My boyfriend and I love it! It was so quick and easy and tasty. Thanks so much for the recipe, I am very excited to try it! Just one question, when you say "Korean chili flakes," is that the same as crushed red pepper flakes: http://www.savoryspiceshop.com/content/mercury_modules/cart/items/2/7/3/2739/chile-crushed-red-pepper-flakes-1.jpg? If not, can you provide me with a photo of the jar/container your chili flakes come in? I couldn't find "Korean chili flakes" in the store tonight. Thanks again! This is absolutely EASY and so TASTY. I struggle with some Korean dishes, as I usually mess something up and SOME TASTE is missing that I can't point my finger at. This was so easy, and turned out WONDERFUL. Both boyfriend and I loved it. I used pork tenderloin thinly slice (as I had it on hand) - and while it took a bit longer to cook it was still perfect. Thank you so much for this recipe! It's a keeper! That's wonderful to hear! Glad that you liked this recipe. It is indeed simple to make and so delicious! Thanks for the comment! Making this for a mother that does not like spicy food and a five year old brother, wish me luck on controlling the heat! I'll likely leave out the pepper flakes. You can leave the chili flakes out. Hope they like it. I made this. I was born in Seoul. However I HATE wasting leftovers! So if you will, laugh! I used the dreaded honey baked ham as the meat. I omitted the sugar! It wasn't authentic, but it was okay with a kick lol!